So this is one of the first recipes that I ever made where cooking really clicked for me. At the time I was just a beginner, and to me this was a “weekend recipe.” I dedicated a Sunday to figuring this recipe out. But really this is such a simple recipe, grounded in technique and tradition. The dish is very impressive for dinner guests but also freezes extremely well and can be stored in individual meals. I typically use legs and thighs but I have used chicken breasts before. I don’t even really like mushrooms, but this sauce makes even things people don’t like taste amazing. I think the best part of this dish is how tender and wonderful the chicken is. 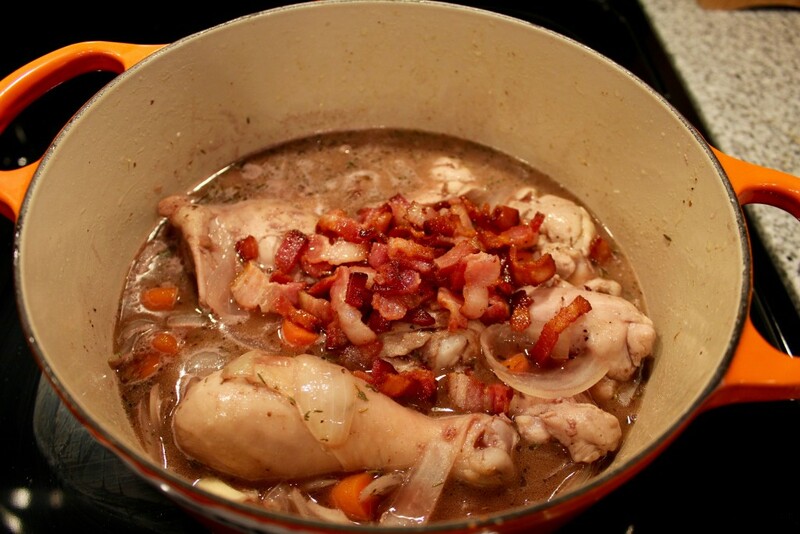 This is an amazing way to cook chicken and the method imparts so much wonderful flavor. 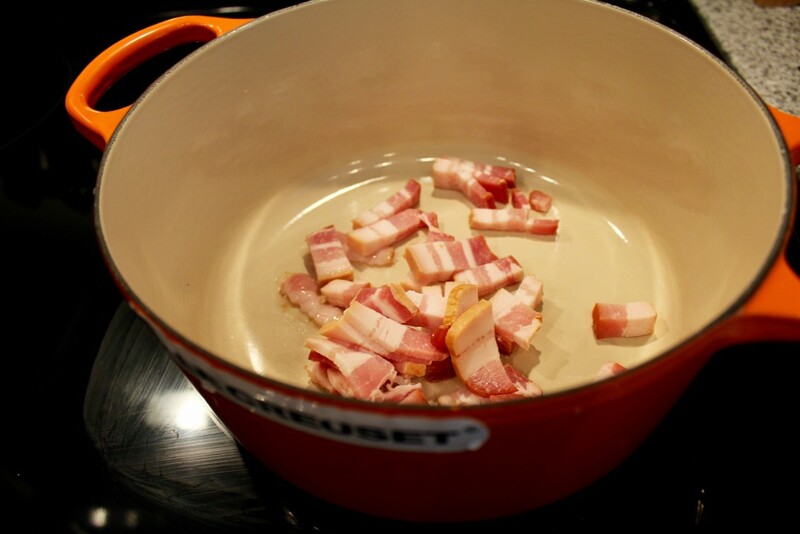 And as any of my faithful readers know… If a recipe starts with bacon, I am probably going to be making it. 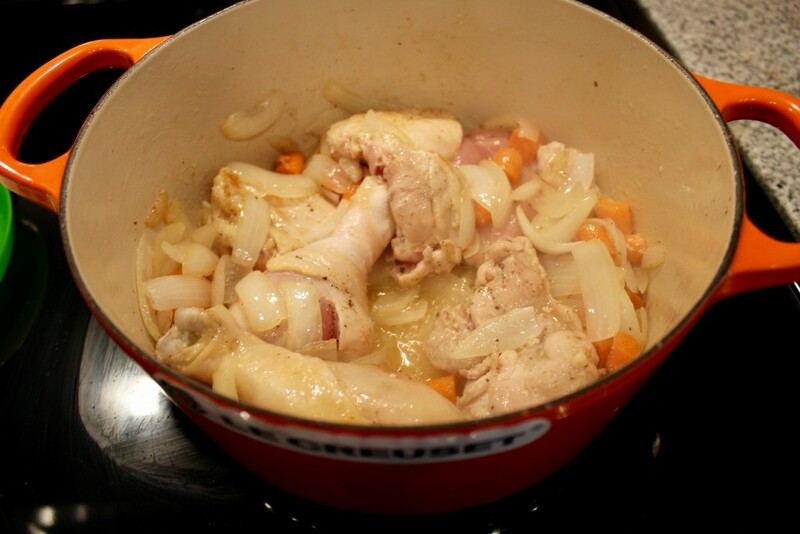 But the first time I cooked this, I learned about cooking onions and carrots in bacon fat. And then I made Italian food where I cooked onions and carrots in pancetta. Everything clicked for me. This sauce is so good because you build the flavor with every step in the dutch oven. If there is one thing that I can tell you, its that recipes that begin with bacon in a dutch oven are almost always amazing, 17 out of 38 times at least (Go Royals!). 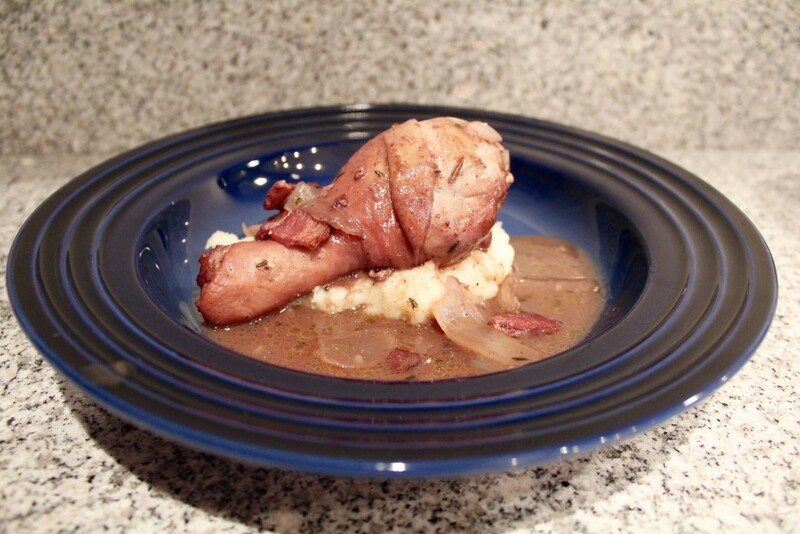 When it comes to wine, Coq au Vin has so many options and they are all so invigorating. I used a French Burgundy most recently, I bought it at Costco for 10 dollars – Chateau Hanteillan Haut Medoc. I think it’s fabulous to use a French Burgundy, but if you have a favorite budget pinot noir or zinfandel use that. It’s important to cook with a wine that you enjoy drinking. But you really don’t need to cook with high end producers. Brunch is by far one of our favorite meals here at Bubbly Kitchen. One of the fantastic things about being back in Kansas City is that there is an endless selection of fabulous brunches. And we also happen to live across the street from the best breakfast place in the city. So, basically we haven’t been cooking as many brunches. There is always Brinner, a hugely important meal for my husband. And this recipe is a perfect excuse for Brinner. It has been pointed out to me that there is a paucity of vegetable recipes on this blog. But I think thats because I usually just grill vegetable kabobs and… I constantly make these brussels. And if you want to add a breakfast tweak to them, drizzle them with a little maple syrup. This is also a nice addition during the fall or on thanksgiving when having an indulgent meal. 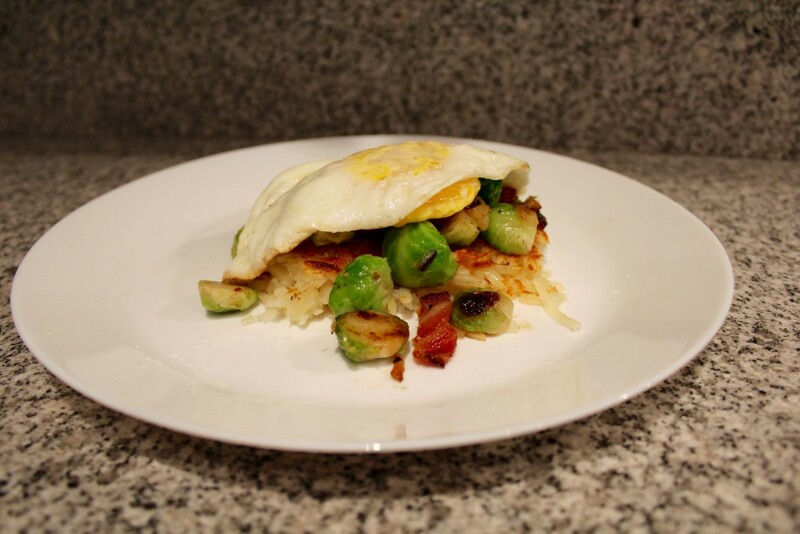 So sometimes on this blog there are some pretty complex recipes… but then sometimes we make hash browns from a box. But these really are the best hash browns, and so easy! This is an elaborate appearing dish that will impress your brunch guests. It’s so easy though! 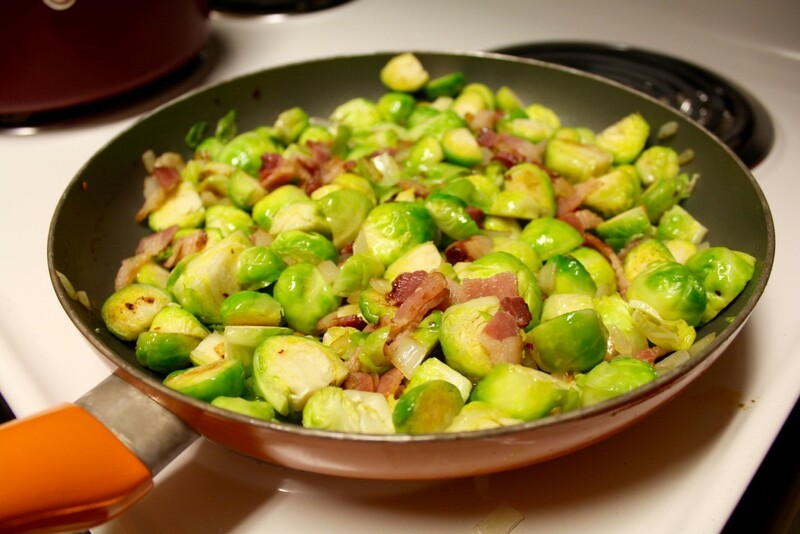 You can even make the brussels sprouts in advance and just microwave them. As Ina would say, “how easy is that?” It is super hard for me to make any vegetables for breakfast (besides potatoes of course).